Well, I’ve heard about it happening, but I’d never witnessed it before, until yesterday. As I turned away, I hoped I would be forgiven for claiming I’m a breeder. It’s true I am a co-breeder, but Colleen did most of the work: she provided the food, shelter, medical care, and socialization. She’s the one who found people for the puppies. I just drove up every weekend to contribute as much as I could. But I do stand by Tooey’s puppies, and if any of those puppy people ever need me or need to return a dog, or if they ever need a question answered, an issue discussed, or an achievement shared, I am there for them. A day later, I’m still thinking — Wow. “Just” a dog. Best money I ever spent was on a dog from a responsible breeder. Tooey has produced beautiful puppies. Her first litter, sired by Cork, has so far included three AKC show champions: Pax, Bold, and Sorcha. 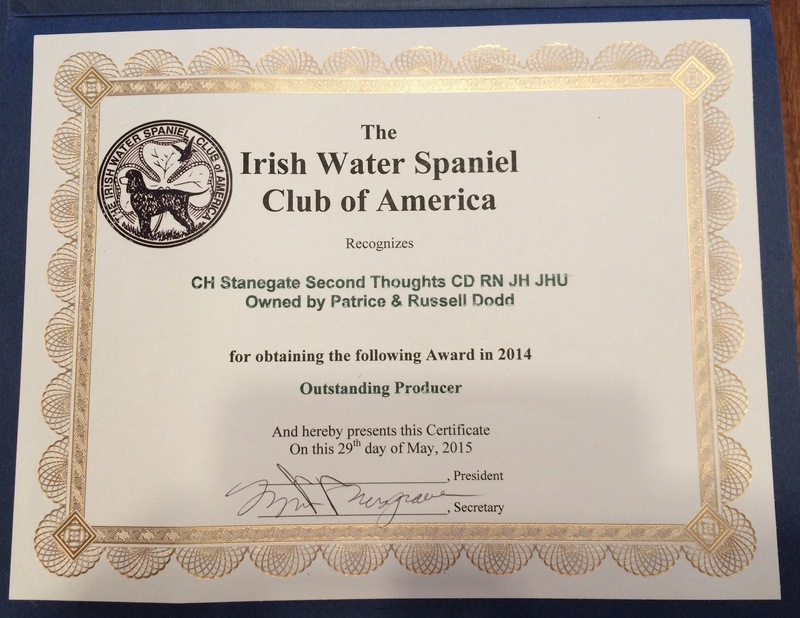 In recognition of this, the Irish Water Spaniel Club of America awards an “Outstanding Producer” certificate. Russ came with me to the IWSCOPS Specialty this year, and since that event is held on the grounds of the house where the Tooey x JJ puppies are lodged, he took that opportunity to capture some more portraits. He got out his gear and took these just before we left to take Tooey home with us. The Tooey x JJ puppies are still very cute puppies, but now they are starting to move and look like dogs. And, since they’re nice and clean, it’s time for some 6-week-old-puppy pictures. Already the pups are walking (actually, kind of lurching) around. Not to be outdone by Mr. Green, who was first out of the whelping box last week, this week Ms. Yellow was first to make it out the dog door and to the outside. The whelping box is gone — I mean what’s the point? Mr. Green or Ms. Yellow would just show everyone the way out. But the dog door is now blocked so Tooey can get out, but not the puppies — they are still too young to be outside. 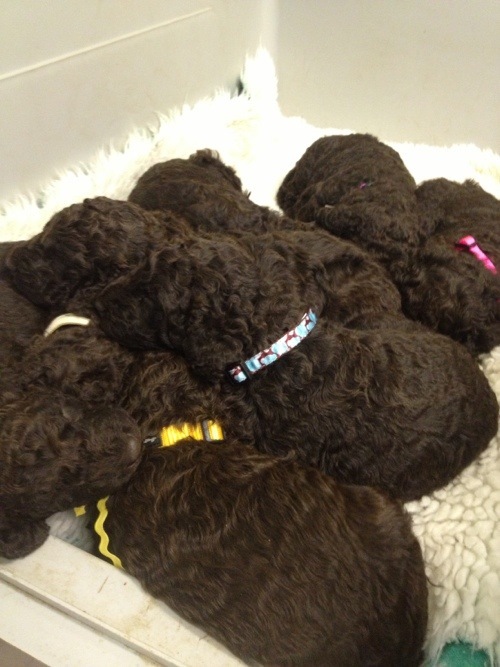 All have their eyes and ears are open, and baby teeth are making white dents in the puppies’ gums. Ms. Pink has made it past the 4 lb. mark at 4 lbs, 1 oz. All the others are well over 3 lbs. and some, except for Ms Yellow, at 2 lbs, 15 oz. Green has two distinct curls in his coat — one by his left rear hip, and the other by his left shoulder. Mr. White and and Ms. Pink are content to be held. Mr. Blue and Mr. Green want to get down when I pick them up, though Mr. Red will let me hold him for awhile before wriggling. Mr. Teal will push anyone out of the way if another puppy is at the teat he wants. Ms. Lavender found my sandal, and tried pulling on it. All are peeing on their own, and except for once (that I saw), they’ve all figured out to pee at least 6 inches away from their mat.